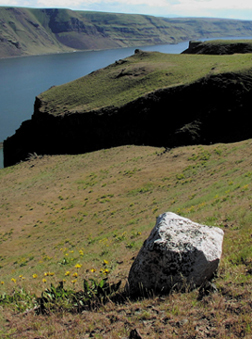 In the Pasco Basin in south-central Washington, boulders lie strewn about in erratic fashion. Rafted in on icebergs during ice age floods, the boulders, which can reach up to 24 feet long and 15 feet high, sit in sharp contrast to the fine soil, covered with sparse vegetation, on which they sit. Until recently, geologists did not understand the frequency or distribution of these ice-rafted boulders. Now, Bruce Bjornstad, a geologist with the Pacific Northwest National Laboratory, and colleagues, say that most of the boulders hail from the Rocky Mountains. They floated in on icebergs during multiple floods from glacially dammed Lake Missoula. During floods in Montana, icebergs brought boulders, such as the one pictured here, to the Wallula Gap in Washington, according to new research. Photo by Bruce Bjornstad. The team surveyed and analyzed 15 square miles of boulder-strewn fields in the basin. They noted the boulders elevation, lithology, size, roundness, shape and surface characteristics. They found that the debris comprises three types of erratics (rocks carried by icebergs): widely scattered and isolated, distinctly clustered or in big mounds. Most of the erratics are rounded, showing significant effects of weathering. More than 75 percent of the boulders are composed of granite or granodiorite. Less than 5 percent of the boulders match the Pasco Basin basaltic bedrock, which explains why they stand out so distinctly on the landscape. The boulders match the bedrock in the mountains north and east of the basin, hundreds of miles away, says Bjornstad, who presented his teams findings at the Geological Society of America meeting in Seattle in November. The study supports the notion that the boulders were deposited after ice dams holding back a huge lake near Missoula, Mont., broke and flooded valleys with water and icebergs, Bjornstad says. Then the ice dams re-formed and broke again, over and over, perhaps hundreds of times during the Pleistocene. Floodwaters and icebergs backed up at the downstream end of the Pasco Basin and slowly emptied through a constricted gap (Wallula Gap), where the Columbia River runs today, like a slowly draining bathtub. The grounded icebergs collected in slackwater areas along the floods route  mainly around the margins of the Pasco Basin. The amount of weathering of the boulders suggests that they were carried in by older as well as younger Ice Age floods, the researchers say. Although glacial deposits of rocks and boulders are common, there probably is not any place in the world where there are so many rocks that rafted in on icebergs, Bjornstad says. His team hopes to use its results to refine interpretations on the timing and frequency of Ice Age floods.